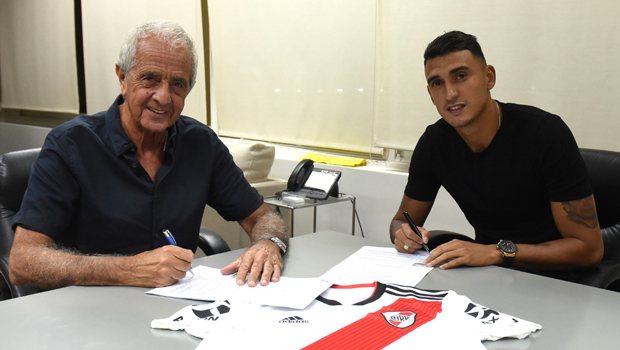 Matías Suárez – new River Plate player On Saturday, January 26th, the forward signed his contract with the Institution until June 2022 and in the following hours, he will be at Marcelo Gallardo’s disposal. After Robert Rojas’ arrival, River Plate’s professional team added a new reinforcement in this transfer market: Matías Suárez, from Belgrano de Córdoba, signed his contract with the Club and will become part of Marcelo Gallardo’s team. On the morning of Thursday, January 24th, the medical examination was carried out. On Saturday, Suárez visited the Monumental Stadium offices to sign the contract (it will last until June 2022), and Rodolfo D’Onofrio was present. -He was Belgrano’s second player with the most appearances (57), minutes (4.599) and goals (10) in the Primera División since his return to the Club. -Since his return, he participated in 16 goals (10 goals scored and 6 assists), more than any other Belgrano player in the Primera División. -He assisted 84 of his teammates’ shots during his final period in Belgrano, during the local tournament, which is twice as many as the player who comes after him (38, Lértora). -Since his return, he was sanctioned 120 times during the local tournament, almost 50 sanctions more than the player who comes after him (72, Lértora). -He was Belgrano’s leading player in terms of assists (6), attempted shots (120), shots on goal (38), fouls (120) and dribbles (79).